Recently I have been working on a product website for a software product of ours. It has a couple of features that make it different from its competitors. And each of these features has a benefit to the user. A long list of features bores everyone. Explaining what the product is and how it is of use to the user is not easy. An article at Copyblogger describes a four step approach (1-2-3-4) to write text that sells products. What I’ve got for you? Start with a simple product overview. What it’s going to do for you? List the benefits and then get back to #1 and explain the features in more detail. Who am I? Show credibility and possible expertise. Why you? What you need to do next? Provide a clear call to action. The always interesting Performable blog recently wrote about product copywriting as well. They argued that there are three benefits that apply to any product or service: speed, ease-of-use or cost. Apple talks on its website about how easy it is to use their products. And Google focuses on speed. But still they only use one benefit and focused on that. So why did they choose that one? Apple is positioning its iPad as the easier alternative to laptops and netbooks…it’s easier to browse, read, and watch video than ever before. Google is positioning their browser against the frustrations people have with slower browsers IE and Firefox. It is all about the here and now. What benefit is most important to your customers at this moment? Instead of trying to mention every feature and the benefit that comes with it, just pick the relevant one and laser focus. While Google uses the 1-2-3-4 approach, Apple goes for an product overview, describes a couple of features and then finishes with the benefits. Seeing how the amount of books and writing blogs that are trying to explain and teach good copywriting, there seems to be no magical bullet for it. The 1-2-3-4 approach offers a good features/benefit balance, and Apple and Google show that you only need one benefit to write compelling content. 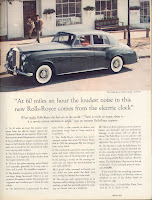 To finish this post I want to look at the legendary Rolls Royce ad by David Ogilvy from 1959. How did he handle the features and benefit problem? Apart from the title and subtitle of the ad it seems a different kind of ad. 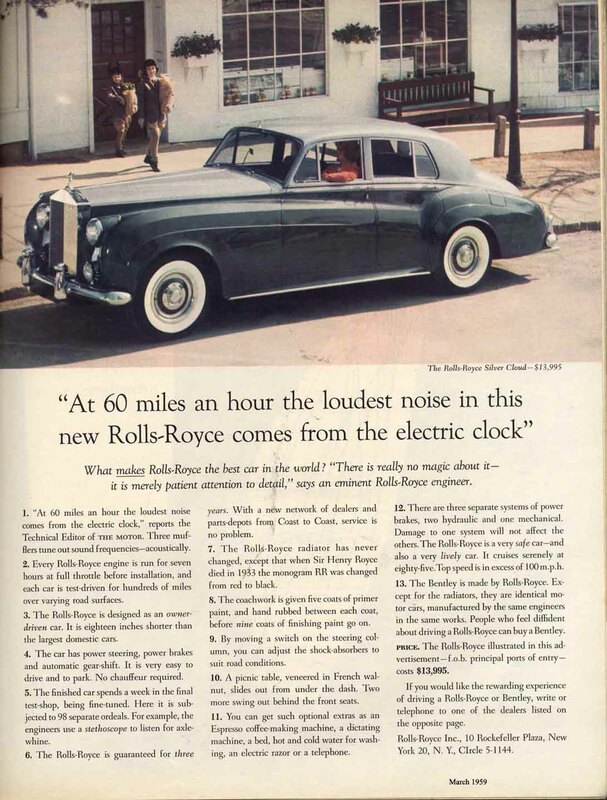 The rest of the ad consists of a mix of features and benefits that focus on the quality of the car. How about those handy picnic tables in French walnut that slide out from under the dashboard! Different times or a different approach?